Last night, the Yankees lost to the Orioles on a botched third out call that made everyone go a little crazy. It actually started before (and likely caused) the blown call: Mark Teixeira decided sliding head first was a good idea. He was called out. He then said the umps wanted to get home early and blew the call on purpose. In his post game press conference, New York beat writers decided to ask Joe Girardi about CC Sabathia's health three times and Joe Girardi decided to be the snippy and smug malcontent he always is with the media. Girardi was pissed about answering the same question three times. Joel Sherman was apparently the reporter who asked the repetitive question that set him off. Later Girardi asked Sherman into his office and they had it out. Reports on Twitter sound as though it was a pretty good shouting match. Sherman, for his part, wrote a scathing article calling the Yankees a bunch of cry baby sore losers without ever once mentioning the altercation. He says the Yankees, in all their anger in how they feel they were done wrong, should "look in the mirror," rather than publicly rant. A fair point. An entire game was played. Focusing merely on what took place at the end misses the mark. 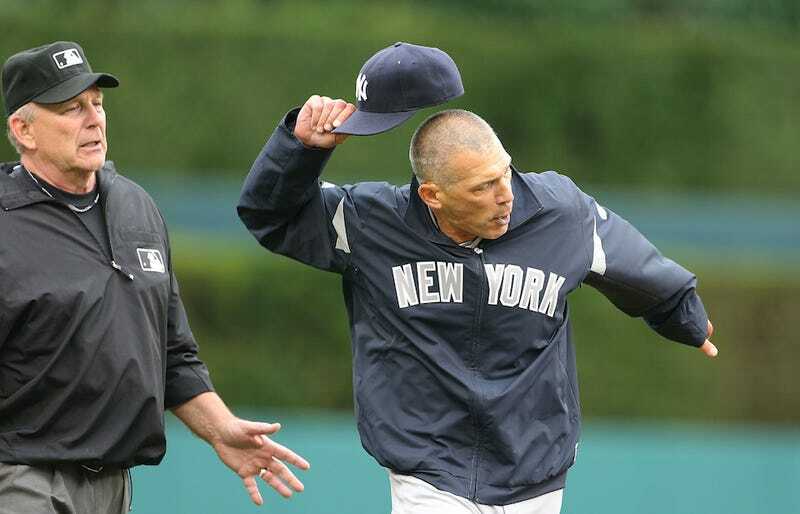 This morning, Girardi again called Sherman into is office, this time for damage control. Yankees public relations guy Jason Zillo was reportedly involved and this thing will be snuffed out quickly. "We're in the middle of a pennant race, emotions run high." "We both have jobs to do, blah." But how about this, hard hitting New York media: Can we get some video of this fight? You all were tweeting it in real time. From smartphones. Equipped with cameras. Did no one get video (or even audio!) of this altercation? Maybe CSN Chicago has it.